Over the Notch and onto the definitive Skyline ridge-walk. Mt. Edith Cavell in the distance. Photo by Kathy Copeland, hikingcamping.com. An opinionated guide to the Skyline Trail hike in Jasper National Park, Alberta. 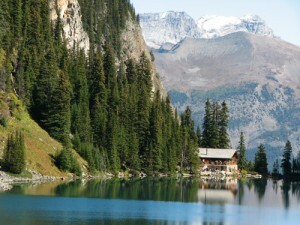 This guide is brought to you by Canadian Rockies hiking experts Kathy and Craig Copeland at hikingcamping.com. The Canadian Rockies quite literally moved us when, in 1990, we immigrated from the U.S. to Canada so we could live next to this tremendous range. Immersing ourselves in such a vast, beautiful wilderness proved irresistibly seductive. To find out what affect it has on you, backpack the Skyline, where the vastness and beauty of the Canadian Rockies is powerfully evident. True to its name, the Skyline allows you to stride near or above treeline for much of the journey. Starting at Maligne Lake, you’ll gain surprisingly little elevation for such a long hike. You’ll have to gear down only once, midway, when you climb the Notch. The Skyline’s topographical profile resembles the spine of a brontosaurus. It’s way easier than the famous Rockwall (Kootenay National Park), which is Stegosaurus terrain. You’ll see peaks near and far, some ferocious, others meek. The limestone canines of the Queen Elizabeth Ranges are visible from the trail as it plies meadows spangled with flowers. The name Skyline refers to the section northwest of the Notch, where you walk a 4.5-km (2.8-mi) mountain crest with body-slam scenery in all directions. Southwest is 3368-m (11,047-ft) Mt. Edith Cavell, the biggest incisor in the northern two-thirds of Jasper Park. West are toothy peaks rising above Tonquin Valley. Northwest, 80 km (50 mi) distant, is Mt. Robson. Fast trekkers can buzz this trip in two days and still have time to wallow in all the flowers: multi-hued Indian paintbrush, lavender lupine, bright yellow cinquefoil, and fluffy, white pulsatilla, to name a few. On the less hospitable dirt-and-rock passes, look for tenacious bluebells. Allow at least an extra day if you want to roam the green ridges west of the trail between Little and Big Shovel passes. The final 8 km (5 mi) are on an old, viewless road descending Signal Mountain. It seems like a never-ending plunge, but you gotta pay if you wanna play. You’d be crazy to begin your hike straining up this end. Starting at Maligne Lake knocks 530 m (1738 ft) off your total elevation gain. If you have just one vehicle, leave it at the trailhead near the Maligne Canyon parking lot, then hitchhike to the lake. It shouldn’t be difficult. When you finish the hike, having your vehicle waiting for you is a relief. If you’re traveling to Jasper from far afield, reserve campsites on the Skyline several months ahead—or risk missing this world-famous hike. Schedule your trip after late July, to ensure the Notch (a steep, narrow pass) will be sufficiently snowfree to allow safe passage. Curator campground, about half way, is the logical choice for your one night out on a two-day trip. But the viewless, trampled-dirt sites at Curator are dismal. Tekarra Lake campground, two-thirds of the way along, is more pleasant. Don’t get caught up here in a storm. This is an alpine route—high and exposed. You’ll be vulnerable to lightning. Snowstorms are possible even in summer. Check the weather forecast at the Jasper Info Centre before heading out. Pack foul-weather gear, regardless. From the junction with Connaught Drive at the north end of Jasper townsite, drive Highway 16 northeast 1.8 km (1.1 mi). Turn right (east) onto Maligne Lake Road. It’s signed for Jasper Park Lodge. Set your odometer to 0 here, then cross the Athabasca River bridge. At 0.2 km (0.1 mi), go left for Maligne Lake. At 5.4 km (3.3 mi) turn right into the Signal Mountain trailhead parking area. This is the Skyline trail’s northwest terminus, where we recommend ending the hike. If arranging a shuttle, leave one vehicle here. Otherwise, park here and hitchhike. If the Signal Mountain parking area is full, drive 0.8 km (0.5 mi) farther and park in the Maligne Canyon parking lot. This is where you should start hitchhiking anyway, just past where tourists resume driving to Maligne Lake. To reach the southeast terminus of the Skyline trail—where we recommend starting the hike—drive or hitchhike the remaining 40 km (25 mi) to Maligne Lake. Continue past the lodge to the parking lot nearly at road’s end. It’s just above the lake’s northwest shore, at 1690 m (5543 ft). The signed trailhead is just above the parking lot’s southwest end, on the forest edge, 40 m/yd before the Bald Hills fire road. Head initially northwest, ascending at a gentle grade through lodgepole pine forest. Within half an hour, pass Lorraine Lake (left / southwest) at 2 km (1.2 mi), 1760 m (5770 ft), and Mona Lake (right / north-northeast) at 2.2 km (1.4 mi). The trail curves around Mona’s southwest shore, high above it. At 5.2 km (3.2 mi), 1817 m (5960 ft), reach a junction. Left (south-southeast) intersects the Bald Hills trail in 2.2 km (1.4 mi). Bear right, immediately cross a bridge to the west bank of Evelyn Creek. The campground here has two tables and bear-proof food storage. Atop the next switchback, pass four tentsites. The ascent continues, tempered by more switchbacks. Heading west into the Maligne Range, the trail affords only glimpses through thinning forest until 2050 m (6724 ft), where the first vista (southwest to southeast) reveals rounded mountains with talus-slope sides. A stream is audible in the forested valley below, just before reaching Little Shovel campground at 8.5 km (5.3 mi), 2140 m (7020 ft). It’s in the trees and has a couple tables and bear-proof food storage. Five minute farther, the trail gently ascends into alplands. The road-trail on the Bald Hills trail is visible east-southeast, beyond the first ridge. The sharply-peaked Queen Elizabeth Range is east. In alpine meadow, about 30 minutes beyond Little Shovel campground, the trail curves northwest and grants a revelatory view of the open terrain ahead. Crest Little Shovel Pass at 10.2 km (6.3 mi), 2240 m (7347 ft). The left side is mostly scree, the right largely heather and krummholz. From the pass, descend into the Snowbowl—a vast, alpine basin where wildflower meadows spread to the horizon. The trail is rough where it drops into a gorge carved by a swift creek. Rockhop the creek at 2085 m (6840 ft). Five minutes beyond is Snowbowl campground, at 12.2 km (7.6 mi), 2090 m (6855 ft). It has a couple tables and bear-proof food storage. Scattered alpine fir on the grassy slopes makes this an inviting site. The peak rising above Little Shovel Pass is visible southeast. Only a sliver of the Queen Elizabeth Range is visible right (northeast). Carry on northwest. 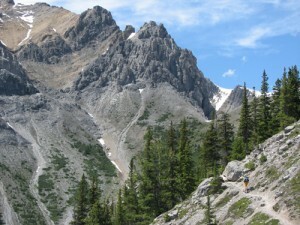 Gentle ridges of the Maligne Range (left / west) invite off-trail exploration. In ten minutes, cross the bridged south fork of diminutive Jeffrey Creek. Cross the bridged north fork 1.4 km (0.9 mi) farther. A gentle ascent crests Big Shovel Pass at 17.8 km (11 mi), 2320 m (7610 ft). An equally gentle descent leads 200 m (220 yd) to a junction. Right (east-northeast) ascends to Watchtower Col, then plunges into Watchtower Basin. 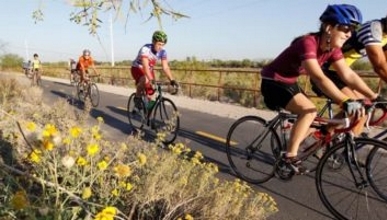 Sans pack, dashing to the col is a quick, easy, scenically worthwhile detour. (Skip below for details.) Bear left (northwest) on the main trail to continue hiking the Skyline. Descend barren slopes beneath Curator Mountain (left / southwest). Reach a junction at 19.8 km (12.3 mi), 2200 m (7216 ft). Go right (north-northeast) for the Skyline. Left (west) descends 120 m (395 ft) to reach Curator campground in 0.8 km (0.5 mi). It has a couple tables and bear-proof food storage. The trail beyond Curator, which we emphatically do not recommend, descends through forest 10.6 km (6.6 mi) to Wabasso Lake, then continues another 3.2 km (2 mi) to the Icefields Parkway, for a total elevation loss of 1100 m (3610 ft). After the 19.8-km (12.3-mi) junction, the Skyline trail curves northwest, around the northeast shore of turquoise Curator Lake. It then steepens, approaching the Notch—a narrow, 2510-m (8233-ft) col. Its southeast side can remain snow-covered until mid-August. Be prepared to kick-step footholds on the final ascent. Atop the Notch, the view extends southwest across the Athabasca River to Mt. Edith Cavell, and northwest to Mt. Robson. A brief, off-trail scramble—145 m (475 ft) up the steep-but-easy slope north of the Notch to a minor summit—significantly broadens the panorama. Back on the trail, resume hiking northwest from the Notch, onto the definitive Skyline. The journey climaxes for the next 4.5 km (2.8 mi), along the barren summit ridge of Amber Mountain. Ups and downs are slight. 360° views are constant. Cruising elevation: 2480 m (8135 ft). Highpoint: 2530 m (8300 ft). About 1 km (0.6 mi) northwest of the Amber Mountain summit, the trail begins switchbacking down the northeast slope, into the basin cupping Centre Lake. At 28.2 km (17.5 km), 2180 m (7150 ft), reach the lake’s outlet stream on the basin floor. Rockhop to the northeast bank. The slope to your right (east) rises to Centre Mountain. Just down-valley (northwest) is 2694-m (8836-ft) Mt. Tekarra. Follow the trail generally north, into the subalpine zone. For about 2.5 km (1.6 mi), enjoy easy walking among scattered fir trees. Pass right (east) of Tekarra Lake (unnamed on the topo), at 2090 m (6855 ft). About 0.6 km (0.4 mi) farther, reach Tekarra campground at 30.5 km (18.9 mi), 2055 m (6740 ft). Situated in open forest, near the creek, next to subalpine meadows, it has a couple tables and bear-proof food storage. Just north of the campground, rockhop to the creek’s west bank, and follow the trail northwest. After a brief, gentle ascent, begin an hour-long contour between 2120 m (6954 ft) and 2160 m (7085 ft): generally north-northwest beneath Tekarra Mountain, curving west then west-northwest onto the flowery slope of Signal Mountain. The angular peaks of the Colin Range are visible north, across Maligne River Valley. Intersect the Signal Mountain fire road at 36 km (22.3 mi), 2150 m (7052 ft). The Athabasca River Valley is west, far below. A left spur leads south-southwest 0.8 km (0.5 mi) to the site of the former Signal Mountain fire lookout. Bear right, pass Signal campground in 100 m (110 yd), and follow the road generally north-northwest. You’ve begun the final leg of the trip: a viewless, 8.5-km (5.3-mi) descent through forest. Make noise frequently to avoid surprising a bear at close range. The road eventually curves east-northeast, then northwest to reach Maligne Lake Road at 44.5 km (27.6 mi), 1160 m (3805 ft). From the junction in Big Shovel Pass, at 18 km (11.2 mi), 2320 m (7610 ft), ascend the narrow path right (east-northeast) 0.4 km (0.25 mi) to 2380-m (7806-ft) Watchtower Col. The new view here is north into Watchtower Basin. For a much-improved perspective west-northwest of the Notch and Curator Lake, continue ascending left (northwest) from the col, up the ridgecrest, to 2420 m (7935 ft). Want to explore Watchtower Basin? Before dropping into it, note the location of the highest lakelet, on the basin’s left (west) wall. Make that your goal. Then follow the trail down: west across scree, curving north through heather. From the col, you’ll lose 365 m (1197 ft) in 3 km (1.9 mi) to reach Watchtower campground at 2015 m (6610 ft). Kathy and Craig Copeland are the opinionated hikers. They write unique guidebooks—bold, intelligent, entertaining and of course accurate—that ensure you make the most of your precious time outdoors. Their titles include “Don’t Waste Your Time in the Canadian Rockies, The Opinionated Hiking Guide,” and “Where Locals Hike in the Canadian Rockies, The Premier Trails in Kananaskis Country, near Canmore and Calgary.” Visit hikingcamping.com to see or purchase any of the Copelands’ books. An opinionated guide to the Crypt Lake hike in Waterton Lakes National Park, Alberta. This guide is brought to you by Canadian Rockies hiking experts Kathy and Craig Copeland at hikingcamping.com. Justifiably famous, this protean journey begins with a boat ride across Upper Waterton Lake. You’ll then hike up Hell Roaring Valley on a roller-coaster trail, pass four waterfalls, enjoy constant views much of the way, crouch through a dark tunnel, and cling to a safety cable as you round an airy mountainside. Ultimately you’ll behold Crypt Lake in its looming cirque. The walls surrounding the emerald water soar a neck-craning 600 m (1970 ft) above the shore. A crowd often snakes along the entire route, creating a carnival atmosphere, but that’s easy to overlook when you’re witnessing such grandeur. Hoping for serenity, come after mid-September. It’s possible to hike here by late June, but you should expect to cross snowfields. Sturdy boots (for kicking footholds) and trekking poles are essential then. If you doubt your ability to negotiate steep snow, wait until mid-July. The Crypt Lake trip is exciting enough without an impromptu luge run. Drive to Waterton townsite. Park in the large paved lot by the tour-boat landing. The shuttle boat crossing Waterton Lake (between the marina at Waterton townsite and the Crypt Lake trailhead at Crypt Landing) operates from late May through early October. It takes about 15 minutes each way. In midsummer (late June through August), you can depart Waterton Marina at either 9 or 10 a.m. and return from Crypt Landing at either 4 or 5:30 p.m. The rest of the season, the boat departs Waterton Marina at only 10 a.m. and returns from Crypt Landing at only 5:30 p.m. Prior to May 28 and after September 20, however, it returns at only 4:15 p.m.
Before planning your trip, check the current schedule and price with the Waterton Inter-Nation Shoreline Cruise Company: watertoncruise.com, <cruise.info@watertoncruise.com>, (403) 859-2362. From Crypt Landing, at 1280 m (4200 ft), the trail climbs southeast via moderately graded switchbacks, through Douglas fir, lodgepole pine and spruce. At 0.4 km (0.25 mi), a spur trail forks right, passing Hell Roaring Falls in 1 km (0.6 mi), rejoining the main trail in 1.8 km (1.1 mi). Staying on the main trail, bear left at 3 km (1.9 mi) where the spur trail merges. Gain 244 m (800 ft) before twice crossing a tributary of Hell Roaring Creek. A few minutes later, a long cascade is visible in the rocky gorge. At 3.7 km (2.3 mi), reach Twin Falls with its huge pool. The trail continues undulating southeast through forest. Cliffs are visible periodically on the right. At 5.6 km (3.5 mi), 1600 m (5250 ft), reach Burnt Rock Falls, which drops 15 m (50 ft). Soon after, you’ll see stupendous Crypt Falls. The ascent now tilts skyward, across open slopes allowing views of cliffs and cascades. After crossing a stream and a talus slope, the trail leads to a ladder. Climb it, then crouch and waddle through a 20-meter tunnel. It was blasted through the shoulder of the mountain to ease access to the lake. Exiting the tunnel, the trail diminishes to an airy route strung with a safety cable. Ascend another ten minutes through whitebark pine to attain the lip of Crypt Lake cirque, at 8.7 km (5.4 mi), 1970 m (6462 ft). Descend 20 m/yd to the lakeshore. Or stay high and proceed right (west) through open forest for another ten minutes, to a viewpoint where you might have less company. Another option is to hike along the east shore to the Canada-US border at the far (south) end of the lake. If you’re strong, hiking to Crypt Lake is a 3-hour task; allow 2.5 hours for the descent to Crypt Landing. Average hikers take 3.5 to 4 hours up, 3 hours down. An opinionated guide to the Cory and Edith Pass hikes in Banff National Park, Alberta. 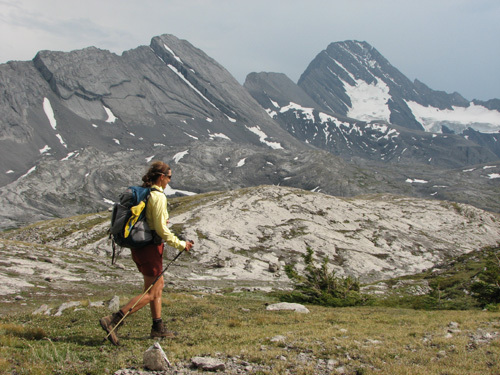 This guide is brought to you by Canadian Rockies hiking experts Kathy and Craig Copeland at hikingcamping.com. The optimal speed at which to appreciate Banff National Park is between 3.2 and 4.8 kph (2 and 3 mph). How do I know this? I recently consulted the Walk the Earth Institute. Membership in this highly exclusive think tank is limited to me and Kathy. Both of us are self-appointed experts on everything to do with foot travel, and our methods are rigourously scientific: if we agree, it must be so. At the Institute’s last convention (yesterday’s hike), we were speculating about the speed at which most tourists stroll the sidewalks of Banff Avenue: 1.6 kph (1 mph) or less, we decided. “Cory Pass,” Kathy said. I agreed. So it was unanimous and therefore indisputable. 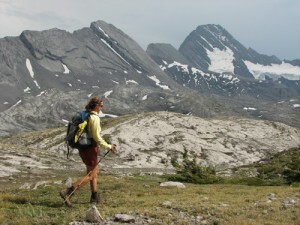 Starting just a few minutes’ drive from Banff Avenue, the Cory Pass hike is an athletic endeavour. Some might call it “punishing.” An 885-m (2903-ft) ascent in just 4.5 km (2.8 mi) places shocking demands on lethargic muscles. But the exhilarating scenery more than compensates for the effort required. 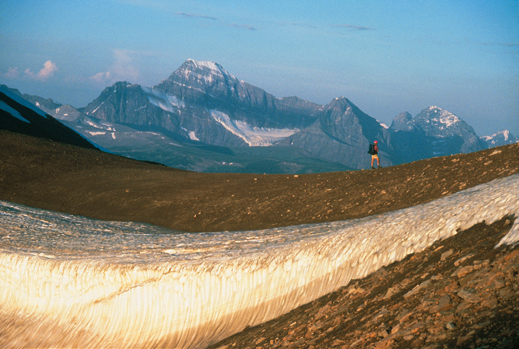 Well before reaching Cory Pass, the airy trail (acrophobes beware) traverses the steep west face of Mount Edith. Lift your eyes from the abyss below your feet, and you’ll see Mount Cory looming just across the canyon. Behind you, the Sundance Range fills the southern horizon. Rock pinnacles give Cory Pass a feral atmosphere. Just beyond the pass, the fang-like 500-m (1640-ft) face of Mt. Louis looms like a monster in a child’s nightmare. The first person to climb it was Conrad Kain, sort of the Captain Cook of the Canadian Rockies. From Cory, keen, strong hikers drop into the aptly named Gargoyle Valley. They round the talusy north side of Mt. Edith, then return via forested Edith Pass. The circuit adds variety and allows a more gradual, comfortable descent. 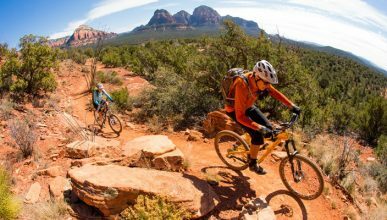 Though this is strictly a hike, requires no scrambling and poses no dangerous exposure, the terrain is rugged, the trail steep. It’s not for the inexperienced or unfit. Turn around at Cory Pass, and you’ll endure a toe-jamming, knee-pounding descent. Proceed into Gargoyle Valley only if you’re secure on loose rock and will remain confident where the way forward briefly requires vigilance. You’re a capable hiker? You’ll enjoy the challenges of the Cory-Edith circuit because they make it a spicy journey. Just give the snowpack on the far side of Cory Pass time to melt; wait til mid-July. Snow usually bars easy passage to Cory until late June. Whenever you go, expect thirsty work on dry terrain. Pack at least two litres of water per person. Also be prepared to endure highway noise from the Trans-Canada while hiking the trail’s lower reaches. The sound of passing vehicles is even louder than it should be, because the majority far exceed the park’s 90 kph (56 mph) speed limit. “Much too fast,” Kathy said. I agreed. There you have it: another certifiable fact, brought to you by the Walk The Earth Institute. From where Bow Valley Parkway (Highway 1A) departs Trans-Canada Highway 1, just west of Banff townsite, drive the Parkway north 0.5 km (0.3 mi). Turn right, following the sign for Fireside Picnic Area. Continue 1 km (0.6 mi) to road’s end. The trailhead is near the bridge over the creek, at 1460 m (4789 ft). Cross the bridge and pass the picnic area. Head east, initially on an old road. In 200 m (656 ft) follow a trail left (marked by a hiker sign). It leads through forest lightened by aspen and broken by meadows. Reach a junction at 1 km (0.6 mi). The trail to Edith Pass continues straight. If you complete the circuit, you’ll return that way from Edith. Go left (north) for Cory Pass. The Cory Pass trail climbs skyward, generally northwest, up the south-facing slope. Crest the forested south ridge of Mt. Edith at 1900 m (6232 ft), having hiked just over 2 km (1.2 mi). Rewarding views begin. Mt. Bourgeau is southwest. The Sundance Range is south. Mt. Rundle is southeast. The trail bends north-northwest and the ascent eases. Ahead is 2553-m (8374-ft) Mt. Edith. Northwest is 2801-m (9187-ft) Mt. Cory. Between them is Cory Pass. The trail follows the ridgeline, continuing at a moderate grade with one steep section. At 2045 m (6708 ft), it drops 14 m (46 ft) into an awkward declivity, then ascends gradually across the barren southwest slope of Mt. Edith. The long, airy traverse is on a very narrow trail crossing several avalanche chutes that are precarious even when snowfree. Snow is still present? Stop. Assess the danger. Lacking an ice axe and self-arrest skills, be willing to turn back rather than risk a serious fall. 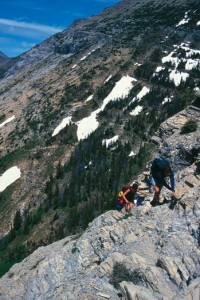 Traverse the canyon headwall to reach the narrow defile of Cory Pass at 5.5 km (3.4 mi), 2360 m (7741 ft). Directly north, across Gargoyle Valley, is 2682-m (8797-ft) Mt. Louis. To continue the Cory-Edith circuit, descend the precipitous north side of the pass. The trail curves right (northeast), dropping rapidly across steep talus through short Gargoyle Valley. Rounding the north side of Mt. Edith, stay high, just beneath the cliffs. You’ll see gargoyle pinnacles through here. Closely follow the cairns through bulky rubble. Near 2000 m (6560 ft), the trail works its way right (southeast). Maintain your elevation while crossing a boulder field for ten minutes. Then watch for a yellow-orange hiker sign on a tree; that’s where the trail enters forest. Ascend then descend yet again before reaching 1950-m (6396-ft) Edith Pass at 9 km (5.6 mi). Mt Edith is now right (west), Mt. Norquay left (east). Trails depart both sides of Edith Pass. Don’t turn left (north), or you’ll drop to the Forty Mile Creek trail. Go right (south), and descend—steeply at first, then moderately—through forest. Reach a junction 2.9 km (1.8 mi) from Edith Pass. You’re now on familiar ground. Right leads north to Cory Pass. Straight leads 1 km (0.6 mi) generally south-southwest back to the trailhead. An opinionated guide to the Burstall Pass hike in Kananaskis country, near Canmore, Alberta. This guide is brought to you by Canadian Rockies hiking experts Kathy and Craig Copeland at hikingcamping.com. We once overheard a conversation at the Burstall Pass trailhead. A man who was about to begin hiking approached another who’d just completed the hike. Clearly he was European, a non-native English speaker, and he hesitated, struggling to respond. “Eet wazz… very strong,” he finally answered, tapping his heart with his fist for emphasis. What a beautiful answer. With just two words and a simple gesture, this foreigner eloquently described the emotional impact of witnessing the Canadian Rockies from atop Burstall Pass. The trip begins on an old road where you’ll stride easily, probing a forested valley beneath pewter peaks. After hopping across (or de-booting and sloshing through) shallow stream channels, you’ll ascend to a hanging, subalpine valley. Then you’ll proceed up the headwall to Burstall Pass, where exhilarating mountain scenery extends in all directions. You’ll see saber-sharp peaks slicing the sky. You’ll peer over the pass into the southern reaches of Banff Park. You’ll have enough visual stimuli to expand your emotions like a spinnaker in a gale. The grassy alpine environs of the pass will prod you to explore, or induce you to lie down and let your mind walk the lush, lonesome bear haven of the Spray River Valley below. Try to keep moving. The ridge southwest of the pass is an easy, exciting, off-trail ramble where the panorama continues to unfold. In particular, glacier-chested Mt. Sir Douglas is more impressive the farther you go. From downtown Canmore, follow signs leading uphill to the Canmore Nordic Centre. Reset your trip odometer to 0 at the Nordic Centre turnoff. Continue ascending on Smith-Dorrien / Spray Trail (Highway 742). Pavement soon ends. After crossing Whiteman’s Gap, proceed generally southeast. At 41.5 km (25.7 mi), immediately past Mud Lake, turn right (west) into the Burstall day use area, at 1910 m (6265 ft). This is across from the Chester Lake trailhead parking lot. From the junction of Highway 40 and Kananaskis Lakes Trail (50 km / 31 mi south of Trans-Canada Highway 1, or 17 km / 10.5 mi north of Highwood Pass), turn southwest onto Kananaskis Lakes Trail. Reset your trip odometer to 0. At 2.2 km (1.4 mi) turn right (northwest) onto unpaved Smith-Dorrien / Spray Trail (Highway 742). At 22.2 km (13.8 mi), turn left (west) into the Burstall day use area, at 1910 m (6265 ft). The trail departs the north end of the parking lot, where there are no trees. Go left (west), past the gated road, up onto the berm. Follow the berm southwest, passing Mud Lake (right). Proceed onto a gravel road curving left (south). Within 70 m (77 ft), where the gravel road continues straight (south-southeast), fork right (south-southwest) onto a narrower, dirt road. Cross another berm, this one channeling French Creek (left) into a culvert. Ignore a faint right (southwest) fork. Ascend south, following hiker signs. Just above, where a trail forks left (southeast), stay on the road curving right (southwest). You’ve hiked just five minutes from the trailhead. From here on, the navigating is more straightforward. Follow the road southwest along the north slopes of Mt. Burstall. Commonwealth Peak is right (north) across Burstall Creek valley. At 2.5 km (1.6 mi) pass Burstall Lakes on your right (north). The road soon tapers to trail. At 3.6 km (2.2 mi), cross braided, shifting, sometimes flooded stream channels in an alluvial flat. It’s wettest in early summer. Expect to wade. The water is shallow, the current gentle, the bottom muddy, so it’s not dangerous, just cold. Robertson Glacier is visible left (south). At 4 km (2.5 mi) begin climbing. Ascend west through dense forest about 30 minutes to emerge in subalpine meadows. The trail bends southwest here. After a brief, level respite, the ascent resumes—south, curving northwest. Crest 2380-m (7256-ft) Burstall Pass at 7.5 km (4.7 mi). North of the pass is Snow Peak. North-northwest are, from left to right, Birdwood Pass, 3097-m (10,158-ft) Mt. Birdwood, Pig’s Tail, and Commonwealth Peak. Distant northeast, beyond the trailhead, is the 3000-m (9840-ft) Fortress. South-southwest is 3406-m (11,172-ft) Mt. Sir Douglas. Continue through the pass, around a sinkhole, to overlook upper Spray Valley. Leman Lake is west across the valley. Distant northwest is 3611-m (11,845-ft) Mt. Assiniboine. For the optimal view, proceed cross-country, ascending about 235 m (720 ft) to the ridgecrest southwest of the pass. You’ll see a huge expanse of Spray Valley, from Bryant Creek in the north to Palliser Pass in the south. Belgium Lake is just north of Palliser Pass. Mts. King Albert and Queen Elizabeth are immediately west of Belgium Lake. After roaming the crest south, where Mt. Sir Douglas appears much closer, return the way you came. While Lake Agnes takes a pretty picture, there are better hikes. Kathy Copeland/hikingcamping.com photo. An opinionated review of the Lake Agnes teahouse hike in Banff National Park on Lake Louise, brought to you by Canadian Rockies hiking experts Kathy and Craig Copeland at hikingcamping.com. On a sunny, summer day, thousands of tourists mill about the paved path along the shore of Lake Louise, in front of the famous Chateau. Of those, hundreds extend their promenade to the teahouse at Lake Agnes. Aren’t these teahouse-bound lemmings missing the point? Don’t they have an abundance of beverage-dispensing machines and enterprises where they live? Isn’t it the absence of civilization that distinguishes Banff National Park from their urban homes and attracted them to vacation here? If you’re capable of walking to the teahouse, you’ll find more fulfillment on other trails, where you might experience at least an inkling of the wildness intrinsic to the beauty of the Canadian Rockies. Compared to nearby alternatives, the Lake Agnes cirque isn’t even that compelling a sight. En route, you’ll see the Bow Valley, but other equally accessible vantages are superior. Upon arrival at the teahouse, herds of incessantly chattering people will likely spoil what little visual delight the scenery offers. Only in spring and late fall does the stampede subside. Saddleback or Larch Valley, both near Lake Louise, are much more climactic goals than Lake Agnes yet require only slightly more effort. They too, however, are popular. To make the Lake Agnes stroll worthwhile, stop there only for a peek, then continue on a genuine hike. You have several options:(1) Ascend to Mt. St. Piran, perhaps with a quick side trip to the Little Beehive. (2) Nip up to the Big Beehive, for a between-your-toes perspective of Lake Louise, then drop to the Highline trail and proceed out to the Plain of Six Glaciers. (3) From Big Beehive saddle, ascend the Devils Thumb. Fit, determined striders who start early can partake of all these options in a rewarding but challenging, 23-km (14.3-mi) day. Atop Piran or the Thumb, you’ll see few other hikers, if any. The Six Glaciers trail is crowned with yet another anachronistic teahouse, so expect a throng, but the peaky, icy panorama here is a vast improvement on the skimpy view at Lake Agnes. It’s raining? Then Lake Agnes might be a worthwhile destination, despite gaining more elevation than the other trips we recommend for dismal weather. The trail is in trees all the way to the lake, so lightning is no concern. And you can warm yourself at the teahouse. From Lake Louise village, go south-southwest on Lake Louise Drive. Continue uphill 5.3 km (3.3 mi) to the actual Lake Louise. About 200 m (220 yd) before the road ends at Chateau Lake Louise, turn left into the bi-level parking lot, at 1730 m (5675 ft). From the west end of the lower parking lot, walk the paved path to the northeast shore of Lake Louise. Bear right. Continue following the paved path west-northwest, along the lakeshore, in front of the Chateau. At 0.8 km (0.5 mi) reach a sign near the lake’s north corner. Go right (northwest), away from the lake. Proceed into the forest on a well-maintained trail. Reach the Lake Agnes teahouse at 3.1 km (1.9 mi), 2120 m (6955 ft), above the northeast shore. The Big Beehive rises above the southeast shore. Mounts Niblock (west) and Whyte (west-southwest) create the cirque. Behind the Lake Agnes teahouse, turn right on the trail to the Little Beehive. Ascend northeast. In 200 m (220 yd) pass a trail descending right. At 0.5 km (0.3 mi), pass the left spur ascending north-northwest to Mt. St. Piran. Continue straight. Reach the Little Beehive at 0.7 km (0.4 mi), 2210 m (7250 ft). The view extends northwest, up the Bow Valley, and southeast, down-valley, to the mountains around Banff townsite. The Slate Range, with 3086-m (10,122-ft) Mt. Richardson the highest peak, is northeast across the highway. After departing the Little Beehive, you have the option of not returning via Lake Agnes. Instead, about two-thirds of the way back to the lake, you can descend left. Then, shortly beyond, turn left again. Soon reach Mirror Lake, where you’re on familiar ground. From there, return the way you came. From the Lake Agnes teahouse, follow the trail southwest along the lake’s north shore. Curve around the west shore. Ascend switchbacks southeast to a 4-way junction atop the ridge, at 1.3 km (0.8 mi). This is Big Beehive saddle. Straight (south) descends to the Highline trail and accesses the Plain of Six Glaciers. Right (southwest) is the unmarked route to Devil’s Thumb. Go left (east-northeast) along the ridgecrest five minutes to the gazebo atop Big Beehive, at 4.8 km (3 mi), 2270 m (7446 ft). You’re now 150 m (492 ft) above Lake Agnes, and 540 m (1771 ft) above Lake Louise. Both are visible below. From Mirror Lake, the Highline trail leads 3.1 km (1.9 mi) southwest to intersect the Plain of Six Glaciers trail. Atop cliffs, above the southwest end of Lake Louise, the Highline affords views of the Chateau, at the lake’s northeast end. At the Highline / Plain of the Six Glaciers trail junction, turn right (southwest) to proceed up-valley toward the glaciers, or left (northeast) to return to the Chateau via the northwest shore of Lake Louise.